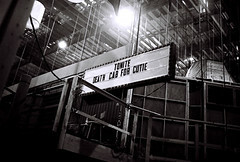 This is a nearly complete mix of Death Cab For Cutie's 2003 album, Transatlanticism, (it was in fact two years old yesterday, Oct 7th - this is a re-post) made up of several live performances done by DCFC last year. All these mp3s are found on the live music archive, Archive.org. Of course DCFC aren't the only band or artist found there... there's lots of stuff to download. These DCFC song titles are mp3 links and I've included links back to the archive where the entire live set can be downloaded at either high or low res. Also the performances can be streamed from each page as well. Track 9 off of Transatlanticism, "Death of an Interior Decorator", isn't found in any of the live sets uploaded to the archive... and so that lone song isn't here. Also I've put up a few album tracks at the end of the live mp3s. *You can find more Death Cab at the Hype Machine.